Brewers grains are the solid residue left after the processing of germinated and dried cereal grains (malt) for the production of beer and other malt products (malt extracts and malt vinegar). Though barley is the main grain used for brewing, beers are also made from wheat, maize, rice, sorghum and millet. In the brewing process, grains are soaked in water until they germinate and then dried to produce the malt (malting). The malted grains are milled and steeped in hot water so that enzymes transform the starch into sugars (mashing/saccharification). 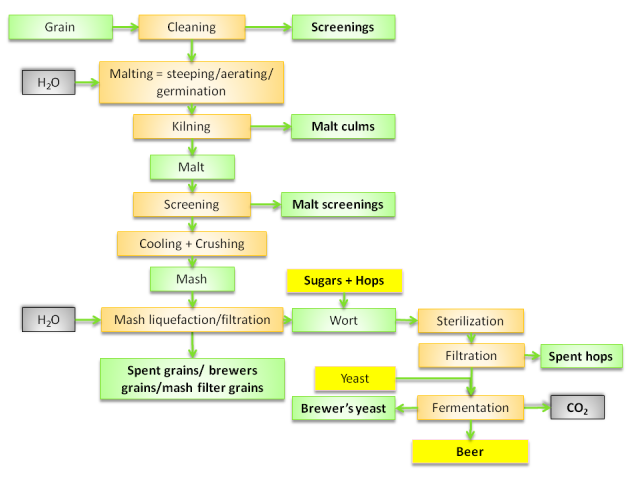 The resulting sugar-rich liquid (wort) is then boiled, filtered and fermented to produce beer (see Figure). Brewers grains are collected at the end of the mashing process, once all sugars have been removed from the grain. The remaining product is a concentrate of proteins and fibre that is suitable for animal feeding, particularly for ruminants (Crawshaw, 2004). Brewers grains are a highly variable by-product whose composition and nutritional value depend on the grain used, on the industrial process (temperature, fermentation, etc.) and on the method of preservation. Brewers grains are sold wet or dried, and can be ensiled (Blezinger, 2003). Brewers grains have a long history in animal feeding. Before the industrial revolution, farms and monasteries in Europe brewed their own beer and fed their livestock with the resulting by-products. These practices changed with the industrialisation of brewing and animal feeding, and brewers grains began being used by the feed industry (Crawshaw, 2004). In 2011, world beer production was about 185 million t (21% in the EU) (FAO, 2013). Since brewery by-products represent about 20% of beer production (Mussatto et al., 2006), world brewers grains production is thought to be in the range of 35-40 million tons (8 million t in the EU). These estimates are relatively imprecise, as conversion ratios between grain, malt, beer and brewers grains depend on the type of beer and on the process. In temperate countries, brewers grains are mostly produced during the warm season, when beer consumption is higher. This means that they are less available for livestock in the colder months when feed supplementation is most needed. Drying or ensiling is, therefore, necessary to defer the utilisation of brewers grains (Boessinger et al., 2005). Wet brewers grains are a highly perishable and bulky product that is costly to transport. Their distribution is, therefore, limited to a radius of 150-350 km around the brewery. Dehydration, despite its high energy cost, facilitates the distribution of brewers grains beyond their area of production, as dried brewers grains are less bulky and less expensive to transport (Crawshaw, 2004). Wet brewers grains contain 75-80% water and deteriorate rapidly due to the growth of bacteria, yeasts and fungi. It is advisable to use them as soon as possible after reception and to make sure that they are in good condition before utilization (Wyss, 1997; Wadhwa et al., 1995; Aning et al., 1994). The palatability of brewers grains decreases with storage time. Maximum recommended storage duration depends on temperature and climate: 2-5 days in warm temperature and 5-7 days in cold weather (Thomas et al., 2010; Amaral-Philips et al., 2002; Aning et al., 1994), though some authors claim that 30-day storage is feasible in winter (Kim et al., 1996). Feed mixtures containing brewers grains spoil quite rapidly, so any excess feed that animals have not consumed should be discarded (Göhl, 1982). Silage is a good method for storing wet brewers grain for a longer period, particularly since ensiling does not alter their nutritive value (Geron et al., 2008). The product should be quickly cooled and pressed before ensiling (Boessinger et al., 2005). Brewers grains can be ensiled without additive or other raw material provided they are put into the silo as soon as possible. The silo should not be too large, protected from rain and tightly packed. The silo should have proper drainage to collect runoff. Storage time can be improved by storing in a shaded or cool place, and by covering the surface with plastic or some other covering material that minimizes surface spoilage (Allen et al., 1975a; Allen et al., 1975b). Brewers grains silage is ready within 3 weeks and can be used over 6 months, and longer if a silage additive is used (Boessinger et al., 2005). Packing and ensiling characteristics can be improved by blending the wet brewers grains prior to ensiling with dry materials such as dry forage, bran or hulls, or with a source of fermentescible carbohydrates such as molasses or cereal grains (Blezinger, 2003; Göhl, 1982). Adding carbohydrates accelerates fermentation, releasing more acids and resulting in a stabler silage (Blezinger, 2003). Ensiling brewers grains with whole crop maize improves fermentation and stability (Koc et al., 2010). When brewers grains are intended for long storage, it is necessary to dry them so that they don't contain more than 10% water (Boessinger et al., 2005). Dried brewers grains can be mixed with spent hops and dried brewers yeast to improve their nutritive value (Göhl, 1982). Fresh brewers grains left on the ground outside the brewery spoil quickly and can become an environmental nuisance, including water pollution. Using brewers grains as animal feed alleviates the environmental impact of the brewing process (Lazarevich et al., 2010; Crawshaw, 2004). Brewers grains are used to feed ruminant and monogastric animals. They are palatable and readily consumed when in good condition. Brewers grains are quite rich in protein (27-33% DM), which makes them a valuable source of protein. The protein value can be affected by the heat applied during the brewing process, which can be beneficial to ruminants but tend to be detrimental for monogastric animals. Brewers grains are also relatively rich in fibre (ADF 17-26% DM), which makes them suitable for ruminants fed concentrate-rich diets, but less so for pigs and poultry. 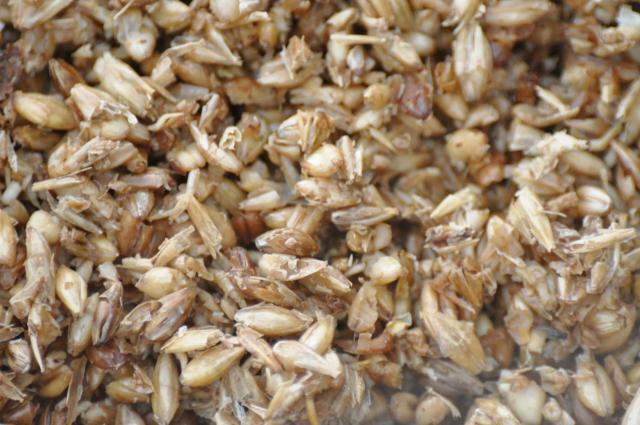 Wet brewers grains are a bulky feed with low energy content, which can limit their use. Brewers grains are a safe feed provided that they are properly stored. In particular, wet brewers grains are susceptible to bacterial and fungal contamination (mycotoxins) and care should be taken to feed only unspoilt brewers grains (Asurmendi et al., 2013). Brewers grains are a good ingredient for ruminants, quite typical in beer-producing countries. Values of OM digestibility found in the literature are variable and range from 55 to 75%. Feed tables from different regions report OM digestibilities from 59% to 67% (Sauvant et al., 2004; Beyer et al., 2003; MTT, 2013; Volden, 2011). It should be noted that chemical composition is not a significant predictor of OM digestibility in brewers grains (Sauvant, 2013, personal communication). Dried brewers grains are sometimes reported to have a lower OM digestibility than wet brewers grains (59 vs. 63%, MTT, 2013; 64 vs. 66-67%, Beyer et al., 2003), which is probably due to the heat treatment. However, a higher drying temperature (240° vs. 180°) was found to slightly increase the in vitro digestibility of brewers grains (Mesgaran et al., 2011). The energy value for dried brewers grains, expressed as Net Energy for lactation, ranges from 5.8-6.0 MJ/kg DM (Sauvant et al., 2004; MTT, 2013) to 6.4-7.0 MJ/kg DM (Volden, 2011), and up to 7.8 MJ/kg DM (NRC, 2001). As a consequence, the value of brewers grains relative to other feeds is itself variable. For instance, feed tables usually consider brewers grains as a better ingredient than tomato pomace (Beyer et al., 2003; NRC, 2001) but one study found the opposite (Aghajanzadeh-Golshani et al., 2010). Brewers grains have a good protein value for ruminants, and are relatively rich in rumen undegradable protein compared to feeds derived from other plants. Brewers grains are thus often used in ruminant production systems with high requirements for by-pass protein, such as high-yielding dairy cows. The effective nitrogen degradability of brewers grains reported in feed tables and in the scientific literature is about 41-49% (Sauvant et al., 2004; Batajoo et al., 1998; Nishiguchi et al., 2005; Volden, 2011; Promkot et al., 2007). These values are lower than those of soybean meal and cereal by-products (Sauvant et al., 2004; Volden, 2011; Nishiguchi et al., 2005), though in one case the protein of distillers dried grains was found less degradable (Batajoo et al., 1998). Nitrogen degradability depends on the amount of heat used during the drying process: in one experiment, the amount of by-pass protein doubled when the temperature rose from 50° to 135°C (Pereira et al., 1998). Heating also decreases protein solubility while increasing the insoluble ADF-bound nitrogen fraction (Enishi et al., 2005). Values for the intestinal digestibility of nitrogen range from 74% (Yue Qun et al., 2007) to 84% (Sauvant et al., 2004), which is much lower than the values reported by these authors for soybean meal, corn gluten meal and maize distillers grains (more than 90%). As usual for cereal grains and their by-products, lysine is the first limiting amino acid in brewers grains used for high yielding ruminants, so it needs to be blended with sources of by-pass protein rich in lysine. It is usually recommended to include brewers grains up to 20-25% of the concentrate DM, and up to 15-20% of the total dietary DM. However, up to 30% has also been recommended (Ewing, 1997), and it has been shown that this rate did not affect milk production in dairy cattle (West et al., 1994). No difference in performance was observed when dried, re-wetted or wet brewers grains were fed to lactating dairy cattle (Porter et al., 1977). Dried brewers grains were found to successfully replace part of the forage in the diet (Younker et al., 1998). However, replacing soybean meal with wet or dried brewers grains in lactating dairy cattle was detrimental to performance (Hoffman et al., 1988). Brewers grain silage could be included at up to 15% in dairy diets with no effect on nutrient intake, production and quality of milk (Geron et al., 2010). Brewers grain silage was found to be a satisfactory replacement for maize silage in rations for lactating dairy cattle (Münger et al., 1997). Brewers grains can be a source of fibre for dairy cattle. They have a positive effect on chewing time, which is higher for brewers grains (56.6 min/kg DM) than for other fibrous feeds such as beet pulp (32.3 min) and maize cob silage (41.6 min) (De Brabander et al., 1999). This is beneficial to the recycling of buffer substances in saliva, which may help to decrease the risk of acidosis. Inclusion rates as high as 40% have been considered acceptable (Ewing, 1997). Up to 24% DM brewers grains in male growing cattle did not alter rumen fermentation (pH, efficiency of microbial protein synthesis and NH3) and OM digestibility (Geron et al., 2008). In a trial with finishing beef cattle fed with 0.5-1 kg or 1-2 kg of ensiled brewers grains, intake and growth performance were lower in the second group, while the performance of animals in the first group was similar to those fed a control diet based on maize silage. Using a pH stabiliser in cattle fed 1-2 kg of ensiled brewers grains resulted in similar performance and carcass quality as in the control group (Morel et al., 1997). Brewers grains were found to be a satisfactory replacement for corn gluten meal in rations for growing heifers (Lopez-Guisa et al., 1991). Recommended inclusion rates of brewers grains in diets for lambs depend on the source. While some authors advise against them (Ewing, 1997), some reports are more positive. In Italy, feeding dehydrated brewers grain to lambs at up to 40% of the diet DM resulted in good growth performance, feed conversion ratio, and in fatter carcasses than with less dried brewers grains (Bovolenta et al., 1998). In tropical and subtropical areas, high inclusion rates have been used in growing sheep without depressing performance or digestibility: in Iraq, 50% of dried brewers grains in the concentrate (Baghdassar et al., 1986); in Mexico, 60% of diet DM from wet brewers grains (with no change in rumen pH and molar proportions of VFA) (Aguilera-Soto et al., 2007); in Brazil, 67% of wet brewers grains associated with Bermuda grass (Cynodon dactylon) (though it decreased DM intake) (Cabral Filho et al., 2007). In Nigeria, the inclusion of 64% dried sorghum brewers grains resulted in higher growth performance than a diet based on maize bran, but adding urea to the latter diet gave a similar performance (Olorunnisomo et al., 2006). In another Nigerian trial, the optimal inclusion rate was 45%, as a 60% rate reduced intake and caused digestive problems (Anigbogu, 2003). In Brazil, wet brewers grains included at 30%, partially replacing maize grains, resulted in lower performance and feed efficiency than dehydrated citrus pulp (Gilaverte et al., 2011). There are few trials on the use of brewers grains for goats. Wet brewers grains replaced up to 25% of the concentrate in diets for goats at the end of lactation but higher rates depressed diet digestibility (Silva et al., 2010). Wet brewers grains included at 20 to 40% in a total mixed ration resulted in lower nutrient digestibilities, but DM intake was higher at the 20% rate (Choi SunHo et al., 2006). In Samoa, a comparative study showed that dried or wet brewers grains were valuable feeds for goats (Aregheore et al., 2002). Brewers grains can be fed to pigs, but their high fibre content and the low quality of the protein, which is deficient in lysine, threonine and tryptophan, make them more suitable to pigs with low energy requirements such as gestating sows and boars, rather than to growing pigs and lactating sows, particularly in intensive production systems (Holden et al., 1991; Blair, 2007; Boessinger et al., 2005). Brewers grains are usually fed dried to pigs, as they are easier to store and more stable (Blair, 2007; Crawshaw, 2004), but they can also be fed wet or ensiled (Boessinger et al., 2005). In temperate countries, dried brewers grains are often not recommended for starter pigs and should only be given in limited amounts to growing or finishing pigs as well as lactating sows (Holden et al., 1991). In growing pigs, inclusion rates up to 5-10% of the diet are considered acceptable (Kornegay, 1973; Pelevina, 2007; Quéméré et al., 1983), though some authors consider brewers grains to be unsuitable for pig feeding (Ewing, 1997). Higher rates tend to be detrimental to intake and performance (Young et al., 1968). 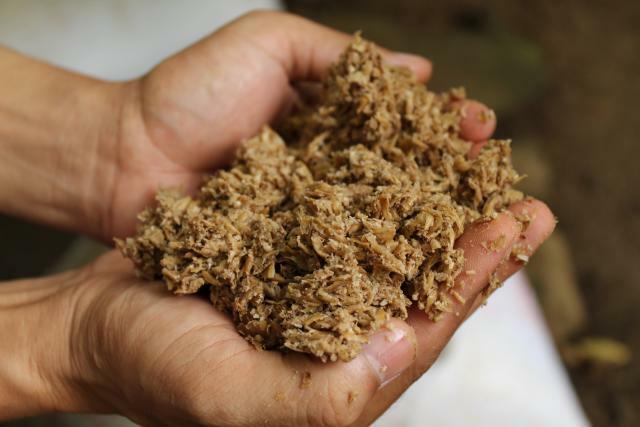 In tropical and subtropical countries, dried brewers grains are a valuable alternative ingredient for growing and finishing pigs. They can be part of the basal diet in combination with palm kernel meal or cassava meal (Amaefule et al., 2009; Fatufe et al., 2007). Dried brewers grains can totally replace rice bran, and partially maize grain (up to 45%), copra meal (50%) and concentrates (8-9%) (Pelevina, 2007; Yaakugh et al., 1994; Ochetim, 1988; Uechiewcharnkit et al., 1985). Inclusion rates tend to be higher than in temperate countries, ranging from 20 to 45% of the diet DM in growing pigs (Aguilera-Soto et al., 2009; Amaefule et al., 2009; Albuquerque et al., 2012; Amaefule et al., 2006; Aletor et al., 1990). Inclusion rates as high as 60% have been used (Ugye et al., 1988). While the inclusion of dried brewers grains decreased feed intake in most cases, it had no or positive effects on feed conversion ratio and carcass traits, and tended to decrease feed costs (Pelevina, 2007; Amaefule et al., 2006; Yaakugh et al., 1994; Aletor et al., 1990). Gestating sows could be successfully fed dried brewers grains up to 40% (DM basis) provided that the lysine level was maintained at 0.5%. Sows readily ate brewers grains and there were no differences in reproductive performance (litter size, litter weight and weight of individual piglets at birth and weaning) (Wahlstrom et al., 1976). Wet or ensiled brewers grains can be used in pig diets, but they tend to have a depressive effect on feed intake, DM and energy digestibility, animal performance and carcass dressing rate (Lazarevich et al., 2010; Aguilera-Soto et al., 2009; Meffeja et al., 2007). In temperate countries, they are only recommended for finishing pigs (over 60 kg) and lactating sows, at about 20% of the diet, or 1-2 kg/d (Blair, 2007; Boessinger et al., 2005), and up to 3kg/d (Edwards, 2002). In tropical and subtropical climates, inclusion rates of 30% in weaner pigs and 40-50% in finishing pigs have been proposed and found cost-effective in spite of the performance losses (Meffeja et al., 2007; Meffeja et al., 2003; Aguilera-Soto et al., 2009). Brewers grains can be fed to poultry but the high fibre content and reduced protein digestibility tend to decrease their nutritional value and metabolizable energy compared to the original grain. As a result, brewers grains are not well suited to the feeding of poultry with high energy requirements such as young broilers. They are better tolerated by older broilers and laying hens. Brewers grains are usually fed dried to poultry, as they are easier to store and more stable than the wet form (Onifade et al., 1998). Acceptable inclusion rates reported in the literature range from 10-20% in young birds to 30% in older poultry. For example, up to 10% dried brewers grains were fed to young poultry (0 to 8 weeks) and up to 30% in older birds (8 to 18 weeks) did not affect growth (Ademosun, 1973). In broilers from 12 to 33 days, 10 to 20% inclusion of dried brewers grains supported acceptable growth and feed utilization, and appeared to favour the development of a well-functioning gizzard (Denstadli et al., 2010). Inclusion rates up to 20% did not depress gain or feed conversion during early growth (0 to 8 weeks), and up to 30 per cent at 8-12 weeks did not decrease performance (Deltoro López et al., 1981b). Increasing the inclusion rate of dried brewers grains in pelleted diets up to 40% without correction for protein and metabolizable energy decreased body weight gain and feed:gain ratio (Denstadli et al., 2010). When diets were fed as mash, even though well balanced for metabolizable energy and protein, birds could not cope with the increased bulkiness of the diet. As a consequence, performance was reduced even at low inclusion rates (10%) (Ademosun, 1973; Onifade et al., 1998). In laying hens, 10% brewers grains did not depress egg production (Yeong et al., 1986; Jensen et al., 1976). Higher inclusion rates such as 20% (Branckaert et al., 1970) and 30% were found to be adequate (Deltoro López et al., 1981a). However, levels higher than 30% depressed performance and a 90% inclusion rate caused very large body weight losses, and inhibition of laying (Branckaert et al., 1970; Deltoro López et al., 1981a). Dried brewers grains are a typical ingredient of rabbit diets in areas where they are available, and have been used as source of protein and fibre for a long time (Scheelje et al., 1967; Varenne et al., 1963; Aitken et al., 1962). They are sometimes included in the control diet in studies about feed ingredients at rates ranging from 5 to 20% for growing rabbits and breeding does (Bamikole et al., 2000; Esonu et al., 1996; Sese et al., 1996; Fomunyam et al., 1984). In studies to evaluate brewers grains as a feed for rabbits, inclusion rates vary between 20 and 30% (Lounaouci et al., 2008; Berchiche et al., 1998; Maertens et al., 1997; Esonu et al., 1996; Omole, 1982; Harris et al., 1979). Some trials successfully included up to 40-45% dried brewers grains in the diet (Adeniji et al., 2012; Omole et al., 1976). 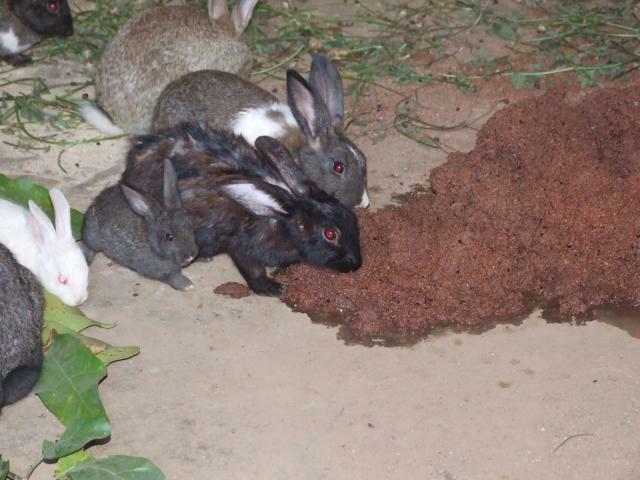 In a digestibility trial, adult rabbits were fed exclusively (during a short period) with pelleted dried brewers grains with no resulting problems (Fernandez Carmona et al., 1996). An important limitation of brewers grains in the diets of growing rabbits is their deficiency in lysine and threonine, as brewers grains only cover about 60 and 85% of the respective requirements for these amino acids (Lebas, 2004). Brewers grains can be used in fish feeding but they cannot be included in large amounts in the diet due to their high fibre content: recommended levels range from 10 to 15%. They should be offered to fish species that are not finicky feeders (Hertrampf et al., 2000). Another issue with brewers grains is their low pelletizing ability and the poor durability of the pellet when brewers grains are included (Denstadli et al., 2010; Hertrampf et al., 2000). NRC, 2000. Nutrient requirements of beef cattle. 7th edition, National Academies Press, Washington D. C.
Scheelje, R. ; Niehaus, H. ; Werer, K., 1967. Kaninchenmast - Zucht und Haltung des Fleischkaninchen. Verlag Eugen Ulmer, Stuttgart: 179 pp. Thomas, M.; Hersom, M.; Thrift, T.; Yelich, J., 2010. Wet brewers' grains for beef cattle. Univ. Florida, IFAS Extension, AN241. Volden H., 2011. NorFor - The Nordic feed evaluation system. EAAP Publications No 130, Wageningen Academic Publishers, The Netherlands, 180p.